What I want to try next: This is enough, thanks. This is probably one of the most unique albums I own. It's definitely not for everyone. I bought the CD based on the one song I knew and a few short samples I heard online. It turned out to be different from what I expected but not necessarily in a bad way. I'm listening to the album as I write this, trying to pick out my favourite songs, but I'm barely paying attention to the music. It sort of drifts over me. It's all very chill and smooth to me, even though the word 'smooth' isn't accurate at all. (I should probably admit, this is the closest thing I own to jazz.) It's hard to describe this music. The lead singer describe the style as 'deep slacker jazz' and I think I could agree with that. 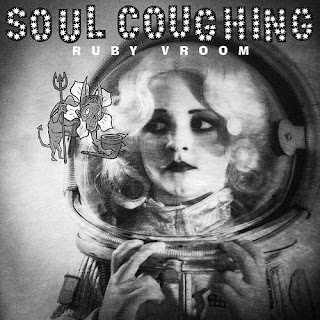 If I want to listen to music and pay attention to it, I wouldn't do it with Ruby Vroom. I think it would drive me crazy and annoy me pretty fast. But if I'm looking for something to just play while I lounge around my room and do nothing, I would play this. ...Is that a weird opinion? Oh well :) I think this might be one of those albums that have to grow on you. I was upset that I bought at first but now, I like it.